Twenty14 Holdings (T14H), the hospitality investment arm of Abu Dhabi-based Lulu Group International, has completed the $120 million acquisition of the Waldorf Astoria Edinburgh – The Caledonian. The deal is the largest hotel transaction in Scotland since the sale of Gleneagles in 2015. The Caledonian operates under the Hilton’s flagship brand Waldorf Astoria. The Caledonian joins a portfolio of $650 million worth of luxury properties across the UK, the Middle East and India that Twenty14 has assembled since 2014. Twenty14 Holdings intends to invest a further $28 million to enhance and expand the iconic hotel at the west end of Edinburgh’s Princes Street. Adeeb Ahamed, managing director Twenty14 Holdings, said: “We are excited to add The Caledonian to the portfolio of Twenty14 Holdings. First opened in 1903 as part of the old Princes Street Railway Station, The Caledonian currently has 241 rooms and offers great views of Edinburgh Castle. “Local perceptions and historical legacies are central to our acquisition strategy,” said Ahamed. “We are honoured to be part of this Scottish landmark that has a great significance for locals and visitors alike. Among improvements planned for the site, Twenty14 Holdings intends to engage local craftsmen to enhance the hotel’s historic Caledonian Suites. The Caledonian is also home to two restaurants operated by Michelin-starred brothers Chris and Jeff Galvin. These are the Pompadour by Galvin and Galvin Brasserie de Luxe. The hotel also houses the only Guerlain spa in the UK. JLL and HVS Hodges Ward Elliott jointly advised on the sale. Will Duffey, Co-Head European Transactions, JLL’s Hotels & Hospitality Group, said: “The hotel has long been seen as a jewel in the crown of the UK hotel market. “Our client’s recent refurbishment programme repositioned the hotel to its former glory when it reopened as the first Waldorf Astoria in the UK in 2012. “We are delighted to have advised on this irreplaceable trophy hotel overlooking Edinburgh Castle to an investor who will preserve and protect this most important of assets for generations to come”. 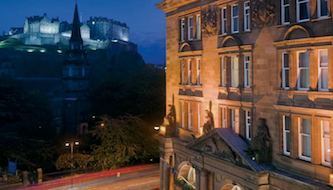 Kerr Young, Director, JLL’s Hotels & Hospitality Group, added: “Edinburgh continues to be one of the best performing and most sought after European hotel markets by both domestic and overseas buyers. “The sale of The Caley follows the recent sales during 2017 of The Scotsman and The Bonham as well a number of other hotels in the Scottish Capital. “This sale marks the largest hotel transaction in Scotland since the sale of Gleneagles in 2015.